Tata Motors has launched the 2014 Tata Nani CNG eMax in India. The bi-fuel car (petrol and CNG) has the lowest CO2 output among cars launched in India, claims Tata, at 75.6 GPKM (grams per kilometer). Though the car has been launched, bookings and delivery is scheduled to happen only after April 2014. “At Tata Motors, the core philosophy behind the launch of every new vehicle is anticipating what our customers need and blending it with the best-in-class technology and design engineering. From its inception, the Nano has been a path-breaking invention and the CNG version only adds to that and also underlines our commitment to be a sustainable automotive player. ” said Mr. Ankush Arora- Sr. Vice President, Passenger Vehicle Business Unit (Commercial), Tata Motors Ltd.
ex-showroom prices Mumbai. The car is offered with a warranty of 4-years or 60000 Km, whichever is earlier. The first and obvious addition to the Nano CNG eMax is the CNG kit and the bi-fuel capability of the car. The Nano CNG eMax is still powered by the 650cc, 2-cylinder petrol engine found in other Nano variant, this motor has been tuned in house to run on CNG. As standard across the nano range, a four-speed transmission is mated to the engine in the CNG eMax too. The engine produces 33 BHP/37 BHP of power and 45 Nm / 51 Nm of torque on CNG and petrol respectively. The Nano delivers a fuel-efficiency of 25 KMPL on petrol and 36 KMPKg on CNG, with a 15-litre petrol tank and a 6 Kg CNG tank (which would probably be able to fit about 4 Kg of CNG) you get an effective range of 520 Km. 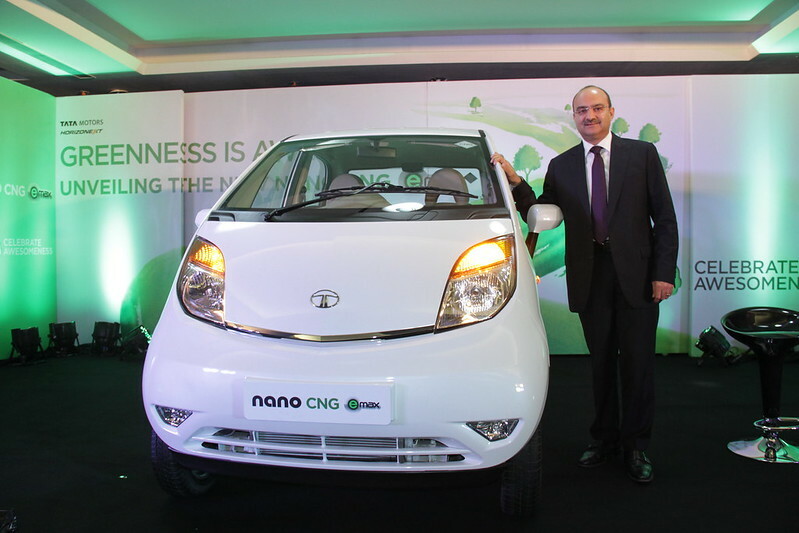 Tata claims that the running costs of the Nano CNG eMax are about Rs. 1.32/Km, which is quiet low. The best part about the Nano CNG eMax though is the fact that its CNG tanks are placed under the front, instead of the trunk as is the practise; this keeps the rear-luggage free. The CNG system in the car is designed for on-the-go shift between fuels, and a leak detection sensor cuts-off the CNG supply for safety. An interlock sensor also ensures that the engine is switched off before CNG filling. The features/equipment and colour options on the Nano CNG eMax reflect that of the comparable non-CNG variant.